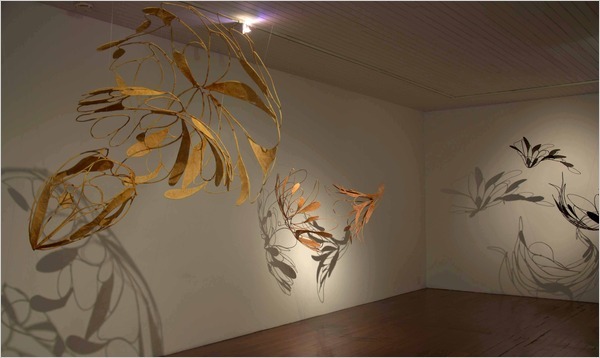 Ranjani Shettar’s skeletal sculptures hung festooned from the ceiling of Talwar Art Gallery from October the 2nd to January the 30th 2010. The filigreed shapes – loops, curlicues and disk-like embellishments – seemed to be suspended in mid-air. From their spare beauty, it would be difficult to guess the arduous, earthy process involved in creating these ethereal works. “It stinks,” Shettar said, speaking from her home in Sagara, Karnataka. She was describing the smell of fermenting iron and jaggery used to make kasimi, a black dye required for the installations. Shettar used kasimi and colours prepared from pomegranates and areca nuts to dye muslin cloth, which she then swaddled around stainless steel ‘armatures’. “It takes three weeks. There’s a whole process for the cloth: using myrobalam, soaking it in cow’s milk and then dying it,” she revealed. These latest sculptures were inspired by the way Kalamkari artisans use dyes “made in their own backyards” – as was “Sun-sneezers blow light bubbles” (2007-2008), a simultaneously spindly and frothy sculpture displayed at the Modern Art Museum of Fort Worth in Texas in February 2009. Shettar, who is from Bangalore and studied at the Karnataka Chitrakala Parishath, has been busy showing at various notable venues in the U.S.A. The 32-year-old’s sculptural installations fuse abstract minimalist motifs with the processes of traditional craft. For her well-travelled piece “Me, no, not me, buy me, eat me, wear me, have me, me, no, not me” (2006-2007), which was on view at the San Francisco Museum of Modern Art’s Rooftop Garden from March to July in 2009, she wove strips of metal, re-cycled from used car parts, into cornucopias – as if effecting a reclamation of the man-made world of waste by a more natural crafting process. The works in Shettar’s recent solo show were subtler and smaller. The Bird Song series echoed Shettar’s own lush ‘habitat’. “I live in an area where I am surrounded by birds and I hear their chirps all day. It’s the joy that I derive from them that I am trying to express,” she said of the four sculptures that composed Bird Song. They looked like line drawings that had gone three-dimensional: some of their loops were filled with stretched muslin, while others outlined negative space. “Bird Song I” contained two trumpet-shaped and two sphere-like pieces, dyed golden-beige and evenly spaced. One of these resembled a deconstructed flower. 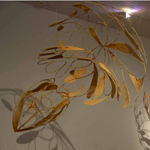 In areca nut-dyed “Bird Song III”, a disk and a trumpet-like object faced each other: a jaunty conversation ensued between the two suspended shapes. The coal black “Bird Song IV” was a swan-shaped structure hanging under another ‘petalled’ flourish. Its welded steel frames were like stretched ligaments or the bony wings of a bird, while the shadows it cast were light and feathery. Another room held a collection of tinier installations. “I’ve been doing large projects for two or three years now and this time I wanted to make something more intimate,” Shettar confessed. The show’s smallest work, “Waiting for June”, was as evanescent as a fleeting thought. Several small pieces of cracked dry terracotta were arranged in a cluster on the wall, reminiscent of parched earth, thirsting for the monsoon. In “Harp and Drumbeats”, antique teak dowels were used to stretch lengths of muslin, so that their taut structures evoked the catgut used in musical instruments. “They are not direct references to a particular type of music,” Shettar said, “I am trying to capture the progression of notes, like in a raga.” The five structures that composed “Drumbeats” were placed at careful intervals – suggesting the beats in a musical measure. The carved teak dowels also recalled the handles of hand-made tools, such as trowels and rakes. The show’s least successful piece, “Leap”, consisted of four muslin ovals of varying sizes. Two of them had holes cut out, one of which contained a smaller oval shape inside it. An exploration of material per se – “Leap” was more like a preparatory sketch for the other pieces than a work in itself. Shettar said that her show possessed a ‘human scale,’ and this came through successfully thanks to her incorporation of low-tech, craft processes. At their strongest, her installations reminded this viewer of the importance of the natural world, signifying the possibility of a harmonious co-existence with it. For instance, Bird Song’s shadows and shapes looked like artful reconfigurations of the tangled branches of trees. In fact, Shettar confided that she had considered using bamboo frames for the work, but chose steel instead because of its flexibility and durability. Yet the delicate installations concealed their industrial core well: softened by skin-like muslin, natural dye and tamarind kernel glue, they suggested the very rustling, chirping and burgeoning of life in nature that inspired their maker. Originally published in Art India, 2009.